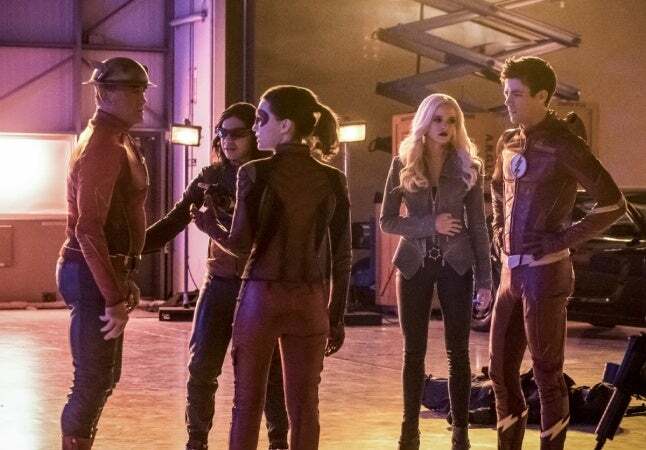 Nice break from the DeVoe storyline... and it’s always nice to see Garrick and Quick. I wonder who the new speedster will be? I really liked this episode. Had a lot of cool character moments and always nice to see Jay Garrick and Jesse Quick. If they truly are writing Shipp out thats a complete waste. Especially since a stand alone episode about him would have been interesting. Seeing what things are like from the persective of The Flash when moving at super speed is pretty cool also. And of course life wouldnt be complete without Iris being the savior of the day. Talk about convuluted and ridiculous. But on the plus side she becomes a speedster next episode so looks like they are going to keep trying to make Iris happen. I agree that it's ridiculous that they are trying to make Iris happen. In the comics she was much better as a journalist like Lois Lane. What bothered me was how the writers ripped the Flash-Iris scene from Wonder Woman when Steve Trevor is talking to WW in the middle of the last scene and the dialogue can't be heard. I assume the writers will treat episode as if it never happened. Nobody is a threat with this kind of power, and it looks like all three of them suddenly have it. Even Supergirl pales by comparison. Cool episode but emphasizes how ridiculous that there is anyone who can beat Flash. Nobody should ever be able to stop him except another speedster. best episode in quite some time. Agreed. This was the best episode in a long long time, perhaps ever. I actually kinda hated this because I’m overthinking how his powers in this episode are contradictory to every other episode. He’s always talked at normal speed while running which would imply he’s just moving fast, not that things slow down from his perspective. This was more like freezing time than moving fast. Even the speed running he typically does was shown while already in “flashtime.” Very inconsistent unless I just missed some dialogue about flashtime being a completely separate power from running. I liked the episode even if they are extremely inconsistent with how fast he is. Half the time they show him running along side cars etc... or something got away....oh wait, here they are. Regardless, I really enjoyed this episode. Something about it. Last edited by Xiroteus; 03-07-18 at 11:41 PM. yeah... best episode since the end of the second season. Still hate how they're using Iris (so so stupid), but outside of that, almost everything clicked in this episode. Felt like the first two seasons again. Love see Jay again. But as usual he was USELESS. They wasting Shipp on this show. He had more to do as Henry Allen then as Jay Garrick. This episode really made the Thinker storyline look bad. Good episode. Pretty cool episode. Also glad we got a break from this DeVoe storyline. I'm not sure I get the complaints about how inconsistent his speed is. We were viewing the scenes with Barry, Jesse and Jay interacting from their perspective, not the perspective of others. The other guys can't see them talk or interact because they are moving in "Flashtime" which is faster than the naked eye can see. Nothing was ever said that they had to be in a running motion for it to work. It's just a TV show, so I don't see the point of over-thinking the science of it. You are missing the point. If that is what they see when running at superspeed, they should never be able to be defeated. Barry has been tripped, hit, knocked down, etc while in super speed. It is inconsistent application of his speed most have issues with. This was a great episode, easily the best we've gotten from The Flash in a long time. Deviating from the mindless Team Flash versus disposable villain of the week formula was a breath of fresh air. It was awesome seeing Flash himself have to solve a problem, albeit with help from each supporting character one at a time. I suggested this very idea in a Flash thread a couple of years ago. It rips off an idea from one of the early Wally West-as-Flash comics when he's in bullet time the entire issue, as terrorists start shooting up a crowded place. Any time they do it from his perspective things move far slower than they have ever shown from the view of others watching them. Even in this episode they had them going even faster than Flashtime. Based on what they normally show and how fast they were moving here it looks like this would be thousands of times faster than we have seen before. Based on this he would be anywhere and have everything done before they can blink. Even with all that said I loved it because it really does not matter. It was fun and entertaining. His speed moves all over the place at the moment. I know the comic Flash can do this. Probably one of my favorites episodes of the series. Since this show always gets bogged down with the season long villians, it's fun to get one off episodes. Jesse being back, and the continuing references to her Earth 2 "team" makes me think we should go over there for an episode at some point. Her team could be comprised of people who were villains on Earth 1 like Brie Larvin and Hartley Rathaway. Exactly. While they have done a good job manufacturing ways how some of the other non-speedster villains can measure up, it doesn't really fully get there if you think about it. And it was very telling that this episode was better simply because ti dropped the ridiculous Devoe storyline. One of the worst cases of the lame Flash villian on the show. I'm hoping that once this Devoe arc is wrapped up (hopefully this season's finale at worst) they will move on to a more believable big-bad. Even if it's another speedster. A hell of a lot less than a second, actually. It was my understanding that Flash kind of slipped into Flashtime as an automatic reflex when the bomb started going off. I don't think it's really something he can control unless his reflexes kick in for a life-or-death situation. The new power they introduced this episode was Barry's ability to pull regular non-speedsters into Flashtime. They even showed that Jesse couldn't do this. I thought they introduced it in the court scene between Barry and Iris? Also, Jesse was exhausted when she tried to bring her dad into Flashtime - she might be able to do it when she is fresh. In fact she lapsed into normal time just after attempting it. This may be the episode where Barry being "The Fastest Man Alive" is actually true. I loved it.